Note: Most of what follows was penned by Rose Marian Brown Williams, Reuben’s granddaughter. 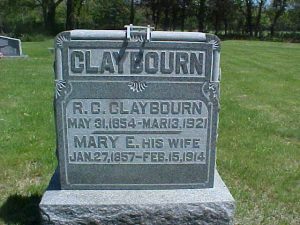 Reuben Cicero Claybourn was born a twin on 31 May 1854, at his father’s home in Texico, Illinois (Jefferson County). He bore the nickname of “Bull” all his life, as explained in the sketch of his twin brother, “Bitts.” The twins were only nine years old when their mother died and eleven when their father married again. 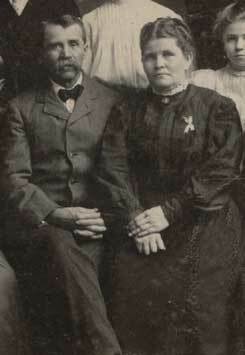 Reuben married at age 24 to Mary Ann Eldorado Williams on 24 January 1878 in Jefferson County, Illinois. They resided at various areas in Jefferson County, then at Kinmundy in Marion County, Ill., residing at the “Miliken” place and later next door west to the Catholic Church. Eventually they returned to Mt. Vernon, Illinois, and resided at (i) 525 S. 15th St. in February of 1907, (ii) 1924 W. College in July of 1907, and (iii) 917 N. 4th St. in July of 1909. Reuben occasionally did construction work on residences and bridges, and was roadmaster several times. He also worked for a short time for the Mt. Vernon Car Mfg. Co., but he primarily engaged in farming, stock raising and dairying. At one time he pastured a herd of dairy cattle in the area which is now the Mt. Vernon City Park. He and his younger sons would rise in pre-dawn darkness to do the milking and then quickly deliver the milk via horse and wagon, door to door, with the milk being measured at the door into a pan, glass jar or any container the customer brought to the door. He belonged to the Methodist Church, served as Sunday school superintendent at different times and as choir leader. All the family liked to sing, and several had good voices. Mary Ann and her daughters. Front row: Opal Laurette. 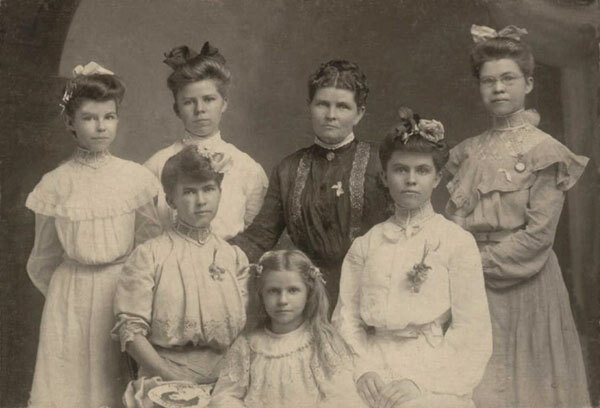 Second row (left to right): Ruby Myrtle & Beatrice Florence. Third row (left to right): Anna Lois, Ethel Belle, Mary Ann Eldorado Williams Claybourn, & Rosella Frances. Grandma Claybourn was a pretty woman with blue eyes and brown curly hair and a temper hot enough to keep it curly. I didn’t know her, of course, but Mom spoke of her, and according to those who knew them both, my Mom was very much like her, both in physical appearance and temperament. Grandma’s bible was her law, her religious beliefs being strict and as vigorous as her temper; her morals unbending, her patience short with those who did not “bend.” She believed vanity to be a sin equal to the more commonly acknowledged sins. My mother had pretty curly hair too, and Grandma would brush, comb and pull Mom’s hair tightly into braid so that it could not curl. This to prevent vanity. Grandma was an excellent seamstress, making all the clothes for the family – including overalls for the boys. She worked very hard raising her large family – a stern disciplinarian – a good homemaker – a good mother. Reuben Cicero’s brood. Back row (left to right): Ruby Myrtle, James Verner Marvin, Ethel Belle, Harry D. Carl, Anna Lois and Noel Clyde. 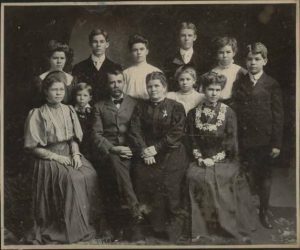 Front row (left to right): Rosella Frances, Wesley Vance, Reuben Cicero, Mary Ann Williams, Opal Laurette and Beatrice Florence. Reuben and Mary’s last home together was a small farm in Jefferson County, Illinois (on North 4th St.) at what was then the northeast edge of Mt. Vernon. It stood at the east end of Park Avenue and atop a big hill, facing west, and was always referred to as “the house on the hill.” Park Avenue was the main street of the new Williams Park addition to Mt. Vernon. The Avenue veered around to the right of the big hill and curved into Fourth Street. The road to the house came straight up the hill from the Avenue for a short distance and made a wide swerve to the left into the barn lot, just missing the huge old tree which stood in the middle of the hill, about half way up. The barn was tucked in the side of the hill, level with the ground at the front and on high pilings at the back, lower down the slope. Behind the barn and at the bottom of the hill ran Casey Fork Creek, a beautiful stream that wound its way around the hill and across the northeast section of the farm, banks shaded with willows and other lowland trees. (The same creek that ran through Wm. Divine Claybourn’s farm some ten miles to the north.) Here lay the fertile pasture and the rich bottom land where corn was planted. Here heavy spring and fall rains caused Casey Fork, now muddy and violent, to reach beyond her banks, flooding the lowlands, but generously depositing her silt for the enrichment of the hospitable pasture land. These semi-annual escapades of Casey Fork would sometimes trap the horses and cattle on the far side of the pasture, and it was a difficult and somewhat dangerous task to lead the stock back through the high waters to the barn at feeding and milking time. In the summer Casey Fork was cool and gentle, her clear water and clean sandy bottom providing hours of wading and splashing fun though not deep enough for swimming. Reuben and Mary’s headstone at the Jordan Chapel Cemetery in Jefferson Co.
After leaving Illinois, Reuben lived for a while with his son Vance in Topeka, Kansas, and then went to his brother Cashus in Palacious, Texas, where he died on 13 March 1921. 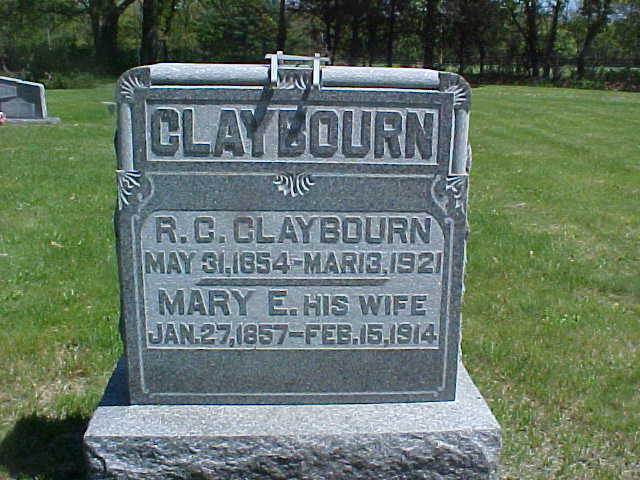 He and Mary Claybourn are buried at Jordan Chapel Cemetery, a short distance east of Dix, Illinois, near his twin, his parents, her parents, and numerous other close relatives. Rosella (“Rose”) Frances Claybourn was born on 16 December 1878, in Dix, Illinois. She married (1st) Jack Wooters on 27 December 1900, but Jack died nearly one year later on 18 September 1901. Rose married (2nd) Charles Marquard (born 20 Sept. 1864) on July 22, 1902. The couple lived in Texico, Kell and Mt. Vernon, all in Illinois. Rose was a milliner and had millinery shops in Kell and Mt. Vernon. They moved to a ranch in Montana in about 1919 and from there to Los Angeles in August of 1921. They owned adjoining city property to that of Rose’s cousin Iva and Frank Randol, and jointly with them owned a ranch in northern California. They had no children but took a lively interest in their nieces and nephews. “Uncle Charley” was a fine photographer, and it is to him that the family is indebted for its treasury of many, many family pictures. Rose died on 2 November 1961 in Los Angeles, California. Minnie Sophronia Claybourn was born on 12 June 1880 and died just over a year later on 31 August 1881. She is buried in Jordan Chapel Cemetery in Jefferson County, Illinois. Ethel Belle Claybourn was born on 15 October 1883, near Dix, Illinois. 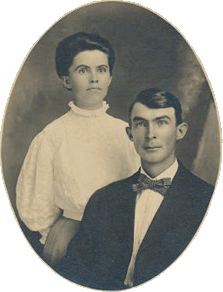 She married Pleasant Ellsworth (born 26 October 1882) on 27 November 1907. (Pleasant would later marry Lola Hawkins, his cousin.) For a time Ethel and Pleasant operated a small country grocery store in Texico which also served as the post office. Later they lived on a farm a short distance west of Texico, across the C.&.E.I.R.R., up the hill and on the south side of the Dix-Texico road. Ethel was more plain in appearance than her sisters but had a kind of serene beauty with clear blue deep set eyes. She was kind, gentle, quiet and deeply religious. She inherited her mother’s compassion for others, and was struck down by the dreadful flu epidemic on 25 January 1919 after her selfless devotion in caring for others, family and friends, stricken with flu. Her funeral was small – many who would have been there were still bedridden, and others, whom she had nursed back to health, were afraid to come. She was buried in the little church yard at Antioch just across the road from her home, never in her short lifetime having been very many miles from the place of her birth. “Too good to live,” they said of her. Pleasant later dropped his first name to go by Ellison and married his first cousin Nola Belle Hawkins (1894-1954) on 15 October 1922. He died on 13 November 1954. He is buried with Nola in Antioch Cemetery. Anna Lois Claybourn was born on 22 March 1890. Anna worked for many years as a telephone operator in Mt. Vernon, Illinois, and later in Los Angeles, California. After her mother’s death, she spent some time working in the Canal Zone, Panama, where her brothers Verner and Noel were, and later in Topeka, Kansas with her brother Vance. She then returned to Illinois when her sister Ethel died and then moved back to Kansas for another year. Vance was then transferred to Texas, and in January of 1920 she went to Los Angeles. In a letter written in 1949, she wrote, “I really did not know where I was going until I laid the cash on the line and said, ‘Ticket to Los Angeles, please.’ I was never satisfied any place until I came here.” She influenced several of her family to join her there. Roughly three years after moving to Los Angeles she married (1st) on 14 April 1923 to John (“Jack”) Mann (born 28 November 1890). They had no children, and Jack died on 13 March 1952. A year later on 4 March 1953, Anna married (2nd) Joseph Alvin LaVigne (born 14 April 1889), a longtime friend and neighbor. The couple lived at 12823 North Chandler Blvd. in North Hollywood, California. Joseph died on 22 September 1971. Anna had no children of her own but was a beloved aunt to her many nieces and nephews. She did many linen cut work table cloths for all of her nieces. Anna died on 16 December 1979 in Los Angeles.